Late last year we wrote a few pieces about tracking best practices. These pieces really struck a nerve. As 2017 gets rolling and many of you are probably thinking about and evaluating your research needs and objectives for the year we thought it would be helpful to revisit and expand on the theme. None of this is new but it seems to be at a fever pitch recently. As such we’ve been fielding a lot of questions about what we recommend as best practices. Utilize one primary aggregate measure. The best in class choice for this measure is our Brand Preference. This is supported by many independently validated research projects, most recently the MASB work presented in this paper. The three most important features of this measure are its ability to capture the impact of all other ‘equity’ measures, take into account competitors and data collection at the individual respondent level. 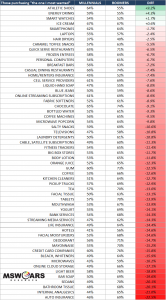 Brand Preference is the cornerstone measure of our Brand Strength Monitor service. Then what we do for clients is customize their trackers to address specific category needs. For example; convenience might be an important measure for one category but not another. To gauge this, each element can be analytically compared vs the aggregate measure to calculate a derived importance. 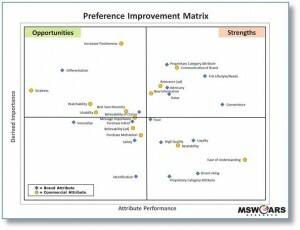 The strengths and opportunities for the brand can then be easily found by crossing derived importance vs. brand performance on the attributes (see matrix example below). This type of analytics is usually done once per year or every two years as category drivers tend to be steady in the absence of disruptive changes in the category. Collectively; the brand preference, the seven cross-category measures, and the category specific measures can be arranged into a score card and tracked over time. Currently 70% of our clients collect this data continuously while 30% do waves (typically two per year). For those that collect it continuously, the data itself is typically rolled up monthly with ‘deep dive’ reports going to management quarterly. So, if you’re like many that we’re hearing from recently, and that with whom we’ve already shared this thinking with, this may be a revelation. If you’d like to read more about this, please contact us – we’re happy to share a full white paper with you and we can discuss your particular needs. Recently, Samsung encountered a problem with some of their lithium ion batteries – they’re exploding! Particularly those in their Galaxy Note 7 smartphones. The causes have been determined1, but there is still a lot to be remedied as many airlines have recently warned passengers not to use them on planes2 and they’ve been forced to issue a recall3. A question you may have regarding this developing situation is: What, if any, impact will this have on the strength of the Samsung brand? Even though they have been receiving a lot of press regarding this issue, Samsung is not the only company to utilize these types of batteries4. Also, Samsung is a very large company with a breadth of quality product offerings that go beyond just battery-powered devices. 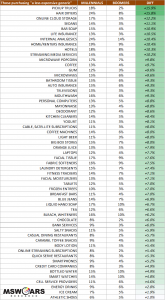 So it is theoretically possible that that the overall brand will not suffer at all. Another possibility is that there will be brand erosion but that it will be confined only to smartphones or, perhaps, to just battery-powered devices. Finally, it could be that the issues will foster a general distrust of the brand that will umbrella over Samsung’s offerings in all categories. 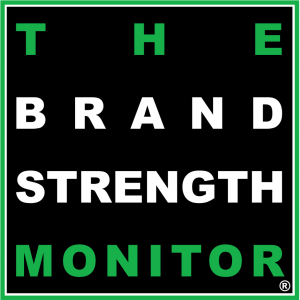 By using The Brand Strength Monitor we can directly answer this question. 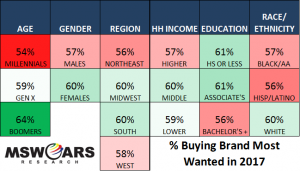 TBSM provides continuous collection of the MSW•ARS brand preference metric, the only independently validated measure of brand value. Through its trend we can quantify what, if any, impact the battery problem is having on the Samsung brand. As shown in the below table, currently seven categories in which Samsung competes are being tracked in this manner. 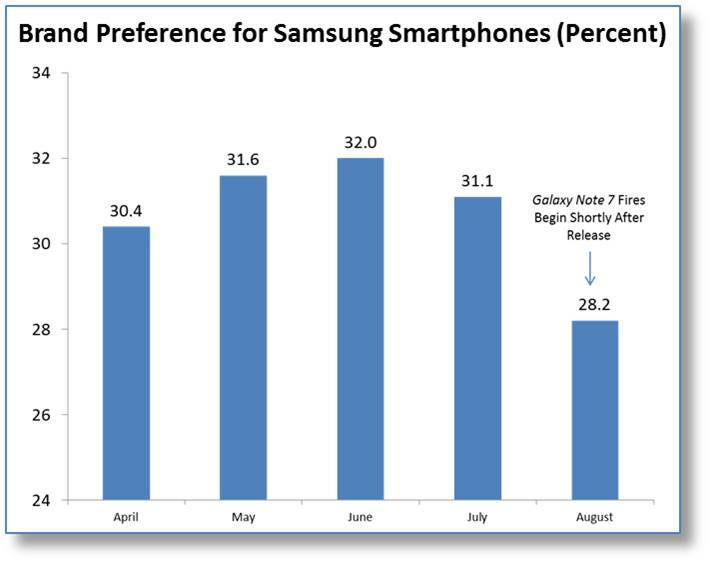 The first observation is that brand preference for Samsung is eroding quickly in the smartphone category. In August alone it dropped over three percentage points versus the prior four months. This erosion does not include the more recent developments regarding the device recall and airline warnings. Once September data (and beyond) is available we will be able to gauge the full extent of this decline. The second observation is that this erosion is spilling over into all categories where battery safety and performance are important product features. 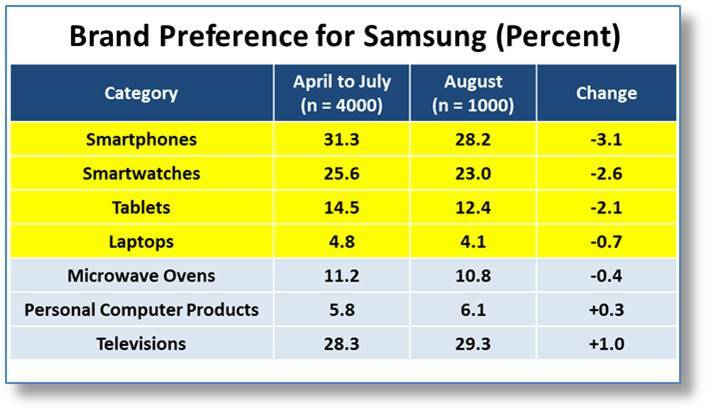 Even though there haven’t been reports of battery issues for smartwatches, tablets, and laptops none-the-less Samsung is experiencing substantial (over half a share point) preference declines in these categories. 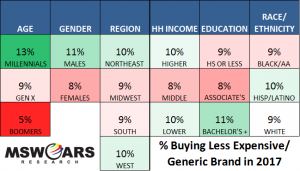 On a positive note, brand preference in the non-battery dependent categories is holding relatively steady. This suggests that overall Samsung corporate equity has not yet faltered (at least through August). If Samsung continues to lose brand preference across its battery-powered device categories, it undoubtedly will take time to rebuild what it once had. However, it will be far from impossible. Brands like Samsung, with strong legacies and established equity, can weather quite a storm. Brands have staged comebacks after much worse incidents – such as Tylenol a few decades ago. Brand preference plummeted 32 points during the Tylenol tampering incident, as the nation watched several people die from the poisoning. The Tylenol brand could no longer be trusted. 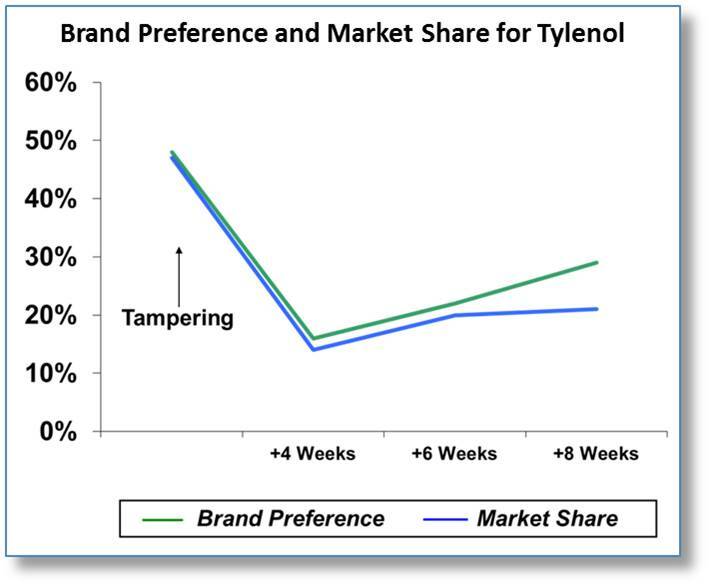 As Brand preference dropped, Tylenol’s market share fell 33 points. As Johnson & Johnson addressed the situation responsibly, the strength of the brand’s previous contract (trust) in the minds of consumers was rebuilt, although a bit more slowly than it was damaged. To be fair, smartphones and tablets (and consequently Samsung’s offerings in those categories) have only existed for a fraction of the amount of time Tylenol had been around during the aforementioned incident. So, while the overall Samsung name may be relatively unscathed by recent developments, its specific lines in battery-powered device categories may not be so fortunate. How Samsung continues to handle this brand crisis will go a long way in determining how low their brand preference will drop – as well as how long their recovery takes. We at MSW●ARS Research will be paying close attention. 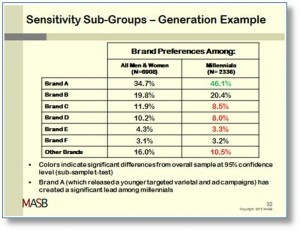 Is Brand Preference Marketing’s Higgs Boson? Creative is King – Long Live Great Creative!